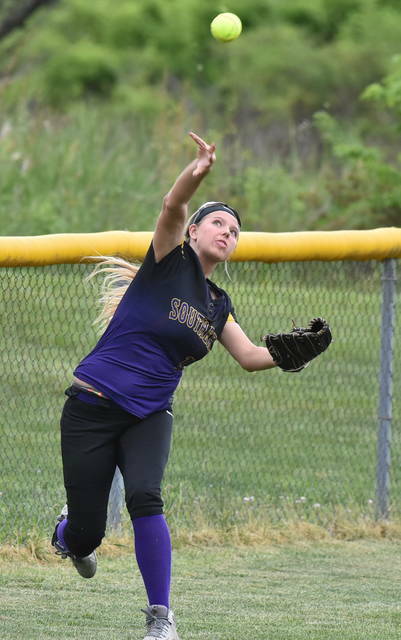 SHS senior Sydney Cleland attempts a throw to first during the sixth inning of the Lady Tornadoes’ 6-0 loss to Notre Dame in a Division IV district semifinal softball game on Friday in Rio Grande, Ohio. SHS senior Paige VanMeter drives a triple to right field during the fourth inning of the Lady Tornadoes’ 6-0 loss to Notre Dame in a Division IV district semifinal softball game in Rio Grande, Ohio. RIO GRANDE, Ohio — Two decisive days of softball. 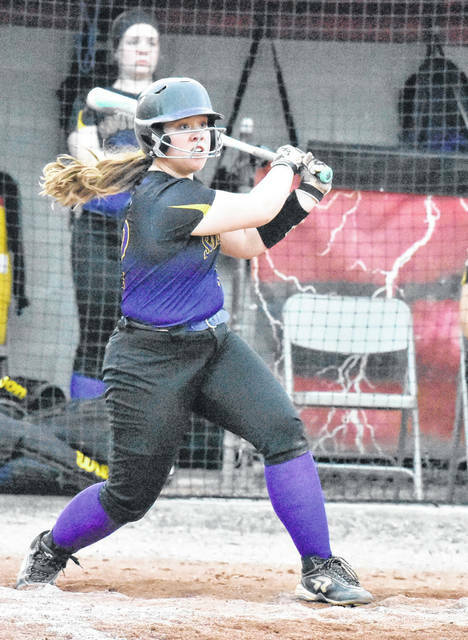 After five innings of play on Thursday’s Division IV district semifinal in Gallia County, third-seeded Southern and the second-seeded Lady Titans were halted due to darkness. Prior to the stoppage, the Lady Tornadoes (13-9) surrendered four runs in the bottom of the first, as Notre Dame charged to a 4-0 advantage by way of four hits and three fielding miscues by the Purple and Gold. The Lady Titans tacked on an additional run in the bottom of the third, when Isabel Cassidy connected on a one-out solo home run to extend the lead to 5-0. SHS picked up its first hit of the contest in the top of the fourth, as Paige VanMeter drove a two-out triple to right field. Notre Dame escaped the inning with no further damage, as Lady Titans pitcher Cassie Scahaefer forced a groundout for the third out of the frame. Notre Dame went down in order in the bottom of the fourth, while Southern was held to one base runner in the top of the fifth, when Kaitlyn DeLaCruz drew a one-out walk, but was stranded in the inning. The Lady Titans put two runners on base in the bottom of the fifth, as Cassidy and Claire Dettwiller each reached on singles before play was suspended due to darkness. The game was resumed on Friday with runners on first and third with out in the frame. Despite the delay, Notre Dame continued to carry the momentum in the contest, as Cassidy scored on a wild pitch in the fifth to extend the lead to 6-0. Southern was held without a hit over the span of the final two innings of play, as the Lady Titans closed out the six-run victory. Sydney Cleland suffered the pitching loss for the Lady Tornadoes, as she surrendered six runs on 10 hits, with no walks and three strikeouts in six innings of work. VanMeter provided the lone hit of the contest for Southern to lead the way at the plate. DeLaCruz and Josie Cundiff each drew a walk in the game, as the Purple and Gold were held to just three base runners over the span of seven innings. Scahaefer was the winning pitcher of record for Notre Dame, allowing no runs on one hit, with two walks, while striking out eight hitters in seven innings of work. Scahaefer also provided a home run on the offensive side. Detwiller, Baylee Webb and Lauren Delabar led the way for NDHS at the plate with two safeties apiece. Webb also scored once and drove in one RBI. Cassidy, Molly Hoover and Taylor Schmidt each provided one hit apiece, to conclude the hit totals for the Lady Titans. Cassidy also scored twice, while Hoover provided one run scored and Schmidt scored once and drove in a run to close out the offensive totals for Notre Dame. Southern committed three fielding miscues, while NDHS had one error in the game. The Lady Tornadoes stranded three runners, while the Lady Titans left four on base. Following the game, SHS coach Alan Crisp was candid regarding his teams effort and reflected on the well-pitched performance by his opposition. “We came out battling,” said Crisp. “We faced one of the best pitchers in the district. We had three errors in the first inning, but we battled. The four runs we gave away in the first inning really set us behind the eight-ball when your facing pitching like that. I can’t say enough how proud I am of the girls. The setback marks the final game for Lady Tornadoes’ seniors Lauren Lavender, Shelbi Dailey, Jolisha Ervin, Josie Cundiff, Paige VanMeter, Jaiden Roberts and Sydney Cleland. 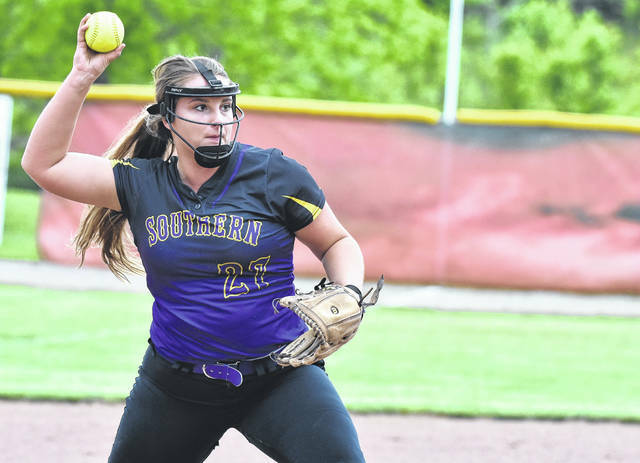 With the loss, the Southern softball team was the final Tri-Valley Conference Hocking Division club to be eliminated from 2018 postseason.